The NASA Earth Observatory posted an excellent image today of the erupting volcano Shiveluch on the Kamchatka Peninsula. This isolated part of eastern Russia is one of the most volcanically active parts of the world, where multiple volcanoes erupting simultaneously are a common occurence. Many Eruptions readers have followed the on-again/off-again funding situation of Russian volcanic monitoring office assigned to Kamchatka and the northern Kurile Island - KVERT (Kamchatka Volcanic Eruption Response Team) - and seen the results to air traffic of some of these large volcanic eruptions. Just looking at the most recent Smithsonian/USGS Global Volcanism Program Report and you'll see no less than four volcanoes on the list (out of 18) - Shiveluch, Karymsky, Kliuchevskoi and Ekarma - while many others can be considered actively erupting as well - Bezymianny, Gorely, Ebeko, and Koryaksky. So, what is driving the volcanism in the Kamchatka Peninsula? For one, it is subduction - the process where one plate slides underneath another. In the case of Kamchatka, the Pacific Plate is subducting underneath the Eurasian plate in a spot of fairly complex tectonics. Two blocks (platelets?) exist between the Eurasian plate and North American plate along the Kamchatka-Kuril and Aleutian arc - the Okhotsk and Bering Blocks - and these two blocks meet halfway up the Kamchatka Peninsula (see below). The Pacific plate is subducting under the Eurasian plate at almost a right angle to the trench at ~3.1 cm/year - and in the middle part of the peninsula we also have the subduction of the Emperor Seamount chain (see below), the far oldest end of a hotspot chain that ends in the middle of the Pacific at Hawai`i. Another thing to keep in mind is that the Pacific Plate is very old (as ocean plates go) in the northwest corner of the Pacific Basin - some of the crust is Jurassic in age (>144 Ma). Many of the most active volcanoes are part of the Central Kamchatka Depression - an area in the middle of the Peninsula - near the edge of the Pacific Plate (see figure below). It is thought that at this point, fertile mantle (mantle that can produce abundant melt) rises up underneath Kamchatka and is fluxed with water/volatiles from the downgoing Pacific Plate, thus producing more melting of the mantle. This double whammy means that lots and lots of magma is produced underneath the Central Kamchatka Depression, which is the home of volcanoes such as Shiveluch, Kliuchevskoi and Bezymianny - all very active volcanoes. There have also been suggestions that slab loss - that is the "catastrophic" peeling away of pieces of the downgoing slab - might be partially responsible for the high levels of magmatism/volcanism on the peninsula as well. The slab loss would cause hot mantle to be brought closer to the surface and generate more melt. Meanwhile, in the south of the Peninsula, melting is dominated by upwelling Pacific mantle, so not nearly as much melt is produced and the volcanism is much less active. So, it could be that the unique location on the edge of a downgoing slab might be one of the causes of the very active volcanism in the Kamchatka Peninsula. So, it seems that the Kamchatka arc might have a lot going for it in terms of producing magma - fast subduction of a plate heading straight into the continent, fertile mantle underneath the arc, abundant fluids being released into the mantle and the potential increased heat for slab loss. Now, this is likely not the whole story for Kamchatka, but it does give us a start in understanding this very active volcanic arc. Churikova, T., et al., 2001, Source and fluids in the mantle wedge below Kamchatka, Evidence from across-arc geochemical variation. Journal of Petrology, v. 42, pp. 1567-1593. 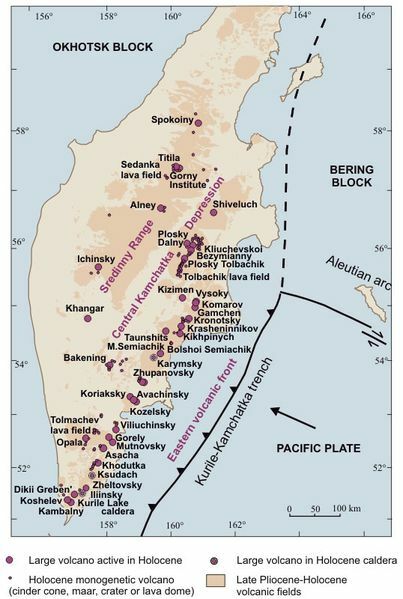 Levin, V. et al., 2002, Seismic evidence for catastrophic slab loss beneath Kamchatka. Nature, v. 418, pp. 763-767. Portnyagin, M., et al., 2005, Transistion from arc to oceanic magmatism at the Kamchatka-Aleutian junction. Geology, v. 33, pp. 25-28.